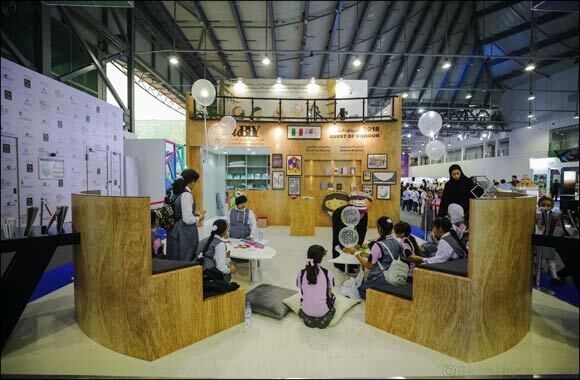 The ‘Read, Dream, Create’ campaign, an initiative of the UAE Board on Books for Young People (UAEBBY), has announced the highly anticipated results of its creative writing competition, during its participation at the 10th edition of Sharjah Children’s Reading Festival (SCRF). Launched during the campaign’s participation in the 9th Sharjah Children’s Reading Festival (SCRF) in April, the contest aimed to nurture the talents of children aged 6-12 years and young people aged 12-18 years, encouraging them to express their ideas and thoughts through innovative and unique stories. Maryam Al Ali, aged 17 years, ranked first for ‘The Black Copybook’, and received AED 5,000. She will be given the opportunity to meet an established author to further hone her skills, as well as attend workshops organised by the UAEBBY. Aged 14 years, Nojoud Ali Al Biddawi came second for her story ‘Doctor after Unrest’, and won AED 3,000, while Haneen Ahmad Al Motwalli, aged 10 years, ranked third for ‘The Annoying Raven’ and received AED 1,000. Apart from the cash prizes, the three winners will be provided with a collection of books and will have their stories published on the campaign’s website. The three stories addressed very different subject matters; ‘The Black Copybook’ highlighted the importance of perseverance and persistence in life, as well as the constant search for acquiring knowledge, experience and expertise. Through an exciting narrative between two characters, the writer conveyed the message that if life is not a daring, breath-taking adventure, it is nothing. ‘Doctor after Unrest’ addresses the experience of an autistic child. The story highlights how his strength and determination and the support of his family enabled him to overcome his condition and continue his education. Having graduated in medicine he goes on to specialise in paediatrics, emphasising that autism is not an obstacle to achieve one’s objectives, but a potential driver to accomplish them. ‘The Annoying Raven’ tells the story of a little girl and her irritation at the annoying calls made by a mysterious crow that appeared suddenly in the forest near her home. The plot reveals the journey she takes in order to reach a solution to the problem and how she finally finds the answer. The Read, Dream, Create competition jury members comprised Emirati writer Noura Al Khouri, whose writings focus on the environment and heritage of the UAE, Emirati illustrator Abdulla Al Sharhan, creator of the Hamdoon animation series and creative director of the Arabic version of ‘Sesame Street’, and Mustafa Jawish, Editor and Member of the Books Selection Committee at Knowledge without Borders (KwB). Launched by the UAEBBY in 2013, the Read, Dream, Create campaign aims to bring young people and books together and develop the capabilities of children and young adults in reading and writing. It also aims to encourage them to read, innovate and create, as well as hone their writing skills and transform their ideas into engaging, well written stories.